I had to try another postcard before bed but I don’t know that this second one is any better. The first one is on top (in the envelope ready for mailing). I’m still not crazy about the zigzag edge. I haven’t been fusing the top and back to the Peltex – maybe that would keep things from shifting on me. Great cards— looks like you’ve gotten that satin stitch down pat. wow. looks to me like you have the zigzag thing all sewed up! (sorry, i’m punny by nature) the edge looks great. you’re allowed to prefer binding for the edge, don’t feel bad about that, but the card looks terrific to me. by the way, i’ve seen birch stands before – i think you captured the feel nicely. Your postcard are great!I buy Peltex 72F which is a double-side fusible and I love it. It works great and nothing shifts when I am sewing and is easy to use. Uh-Oh, Mary sounds like you’re getting hooked. 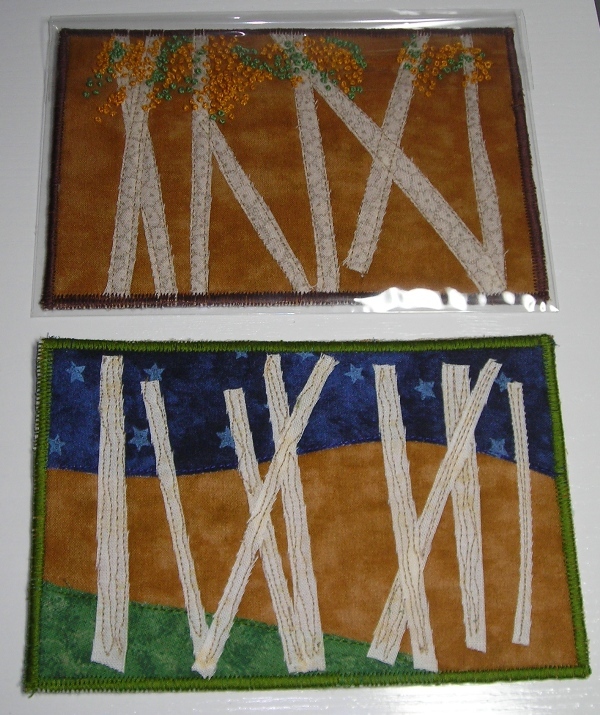 Fusing your front and back to the peltex does keep it all from shifting, and al adds the wee bit of extra stiffness, which is nice for the postcards.I think your birch trees look great. Your edge looks fine too, don’t worry so much…have fun with it.